As almost any family law attorney can attest, manipulative payors exist. Unfortunately, due to a recent decision from the Wisconsin Supreme Court, their gamesmanship may continue. The issue was whether the circuit court was required to order monetary damages for certain members of the class who were inmates at the jail as a remedial sanction against the defendants for their repeated violations of the consent decree, when there was no dispute that the violations had ceased. The Supreme Court held, in a 4-3 decision written by Justice David T. Prosser Jr., that because breaches of the consent decree had ceased before the action for contempt was filed, the circuit court was correct in refusing to impose a remedial sanction against the defendants for their past contempt. 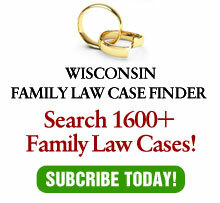 The high court relied heavily on Frisch v. Heinrichs, 2007 WI 102, a family law case. Frisch outlined on a concept called “continuing contempt.” In Christensen, the justices held there was no continuing contempt because the violations had been corrected before the contempt action was filed. In the family law context, this raises the issue of whether there is continuing contempt if a payor of support pays the arrearages before a contempt action is filed, but does not pay any costs incurred as a result of the delinquent payments, such as attorney fees. Since remedial contempt sanctions can only be applied if the contempt is continuing, what happens if the violation of the court order has ceased, but the harm caused by it has not been remedied? The issue is significant in family law (which is why the State Bar Family Law Section and/or the American Academy of Matrimonial Lawyers should have filed an amicus brief in this appeal), because if there is no “continuing contempt” once back support is paid, a payor could cause substantial costs to be incurred without any practical remedy. A manipulative payor, a/k/a a “contumacious party” per Chief Justice Shirley S. Abrahamson’s dissent, could run up arrears and then pay them before a contempt action was filed – or heard. It is highly unlikely that any district attorney would initiate punitive contempt proceedings against a payor who is no longer in arrears. The issue is magnified if the holding in Christensen is applied to a case where a violation of a court order is cured after the filing of a court action, but before the hearing. While not totally clear from the Christensen opinion, it would seem logical that contempt is continuing as long as the greater harm it caused continues, whether the underlying violation was cured prior or after filing of a court action. Unfortunately, none of the examples used by the court specifically address the issues of costs and attorney fees. One would hope that future cases will recognize that the contempt continues until all harm that it caused is remedied. It should make no difference if the underlying contempt was remedied before or after an enforcement action was filed — in both cases, there was additional harm caused by the failure to abide by the court order. This would be consistent with Frisch, where the contempt was continuing after the underlying contempt (failure to provide income information) was remedied because the harm caused by the failure (additional child support) was not remedied. The issue is important enough that I asked attorney Charles H. Bohl, a shareholder at Whyte Hirschboeck Dudek S.C., who was counsel for the defendants, for his take. He suggested that the issues in the opinion relating to contempt law might have to be addressed at the legislative level. Given that few people in contempt proceedings have the resources to litigate, much less appeal, these issues, legislation might be a necessary option. These words turned out to be prophetic, and one unintended consequence may be uncertainty.